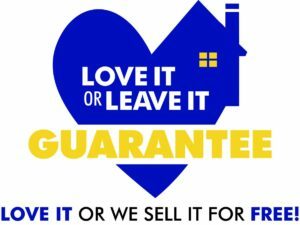 We take the risk out of buying a home by offering you our Love It or Leave It Guarantee. Buy a home with confidence, knowing that if you don’t absolutely love it within the first 12 months, we will sell it for free on our side and help you find a new home. We put our money where our mouth is and will make sure we find you the best home that meets your budget-or we sell if for free for you. As top REALTORS® in Sioux Falls, The Amy Stockberger Team has helped thousands of home buyers find the home of their dreams that matches their budget. Our services are completely FREE to the buyer for all homes listed on the Multiple Listing Service. And, not only are we equipped with over 43 years of combined experience, the synergy of having such a large team gives us the knowledge of fabulous homes that are for sale that aren’t even on the market yet. Great experience! She was able to pull everything together very quickly for us during the buying and selling experience. We appreciated her advice and quick response time to our questions/concerns. The interactions months after our sale have continued to be nothing but positive. We Will Never Work With Another Realtor! Best realtor ever! I never felt dumb asking questions. Always a quick response no matter what time of day it was. Always very knowledgeable. Would recommend her to anyone!